Many Android phones can create handy hotspots to share your phone's internet connections, but they can be tedious to set up. 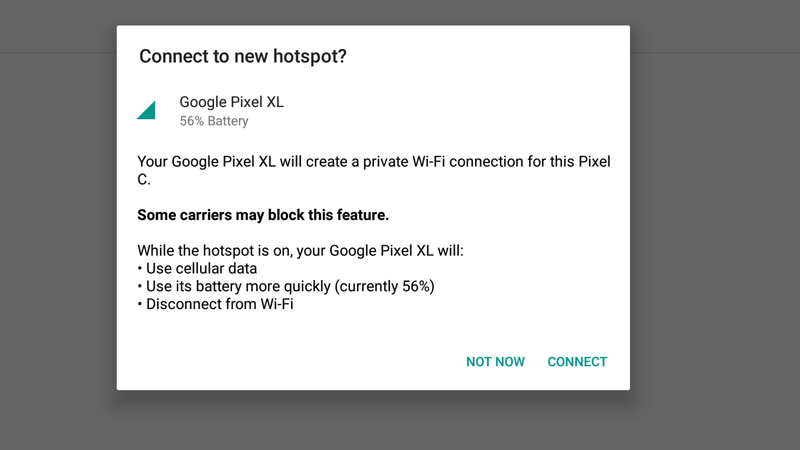 Google wants to fix this with its new Instant Tethering feature. The new feature is currently rolling out as an update to Google Play Services. When you have multiple devices logged into the same account and one loses a connection, it will automatically offer to share another device's internet connection. For now, the feature is very limited. Only Nexus and Pixel devices running Android 7.1.1 are supported. Furthermore, only phones like the Pixel and Pixel XL will be able to share their internet connection with tablets like the Nexus 9 and Pixel C, not the other way around. One Pixel phone can share its connection with another Pixel phone, however. It seems that Google is still testing to this to see how well it will work. However, if this works out it should make staying online much easier. Because everyone carries 2 pixel phones logged into the same google account.